Brown ground beef in large skillet. Drain. Reduce heat to low. 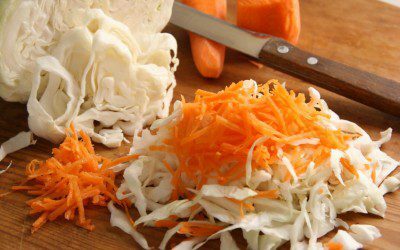 Stir in cabbage, carrot, and caraway seeds; cover. Cook 10 minutes or until vegetables are tender, stirring occasionally. Stir in vinegar. (Add 1 tablespoon water for extra moistness, if desired.) Season with salt and pepper to taste. Variation: Substitute 1 teaspoon sugar and 1 tablespoon white wine vinegar for 2 tablespoons seasoned rice vinegar. Exchanges per serving: 1 Vegetable, 2 Meat.